Robotic colorectal surgery may sound like a futuristic procedure, but it’s a contemporary solution that provides excellent results for patients who suffer from colon and rectal diseases. The goal with colorectal robotic surgery is increased visualization of pelvic structures by assisting the surgeon in ways that were not possible before. Dr. Kamrava is an experienced surgeon who is board-certified in colon and rectal surgery. He has been fellowship trained in the use of the robot for abdominal and pelvic surgeries. To provide the best possible care for his patients, he is certified in both laparoscopic and robotic surgery. What is Robotic Colorectal Surgery? Robotic colorectal surgery uses technological advancements to improve a surgeon’s visualization and dexterity in certain procedures. During the minimally invasive procedure, the surgeon controls a robotic instrument that is able to operate on a patient with intricate tools, allowing more precise maneuverability. Unlike standard open surgeries, which require a large abdominal incision, a robot-assisted procedure makes use of several small incisions. The goal is less surgical trauma in order to produce less pain, a shorter recovery time, as well as more aesthetically pleasing cosmetic results. Who is a Candidate for Colon Cancer Robotic Surgery? If you’ve been diagnosed with colon or rectal cancer, you’ll want to explore your surgical options. To begin with, Dr. Kamrava will give you a through physical examination. He will also evaluate your medical history and assess whether or not you are a candidate for robotic surgery. 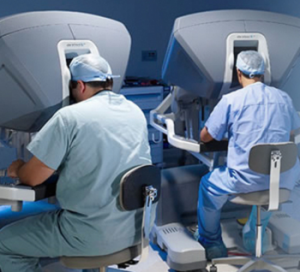 Robotic surgery will not necessarily benefit all patients, and a careful history will aid in this determination. It’s common to have questions about minimally invasive procedures and robotic colorectal surgery. As you investigate robotic surgery further to decide whether or not it’s the most appropriate option for you, Dr. Kamrava is happy to provide you with all information you need to make a decision. Here are answers to some of the most frequently asked questions about robotic colorectal surgery and colon cancer robotic surgery. If you have additional questions or would like to schedule a consultation, please feel free to contact our office at 424.279.8222. Q: Why would you choose robotic surgery? A: Robotic colorectal surgery combines the knowledge of an expert surgeon with increased mobility and precision. Robot-assisted technology allows a surgeon to operate in an even more delicate and efficient manner. Q: Are there any benefits over traditional surgery? A: With robotic colorectal surgery, outcomes are similar to standard surgeries, but there are many benefits that standard, open procedures lack. Reduced pain, faster recovery time, and less blood loss all produce a minimal amount of trauma for the patient. Q: What type of colorectal conditions can be treated with robotic surgery? A: Patients who suffer from a variety of colorectal diseases may want to consider robotic surgery. In addition to the minimally invasive aspect of the procedure, the technique optimizes safety and precision. Q: Is robotic surgery an option for colon cancer? A: Yes. Colon cancer robotic surgery is an option for certain patients. To receive the most advanced type of medical care for your colorectal condition, contact Dr. Kamrava today. He is a board-certified expert who utilizes robotic colorectal surgery when appropriate in order to optimize his patients’ outcomes. Schedule a consultation today by calling 424.279.8222! Next, learn about lap coli, hernia, and lipoma removal.